The 1049cc triple 4-stroke engine fills a need for executing a wide range of tasks. 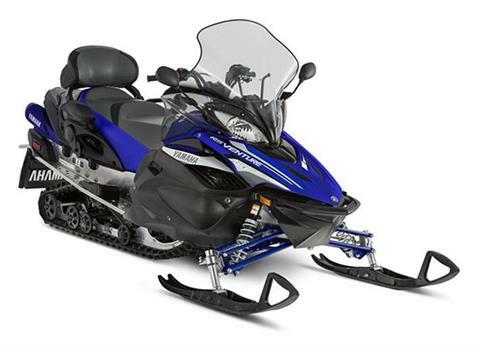 PRO COMFORT 151 REAR SUSPENSION: The dual shock, coupled rear suspension is specifically tuned for all-day comfort. 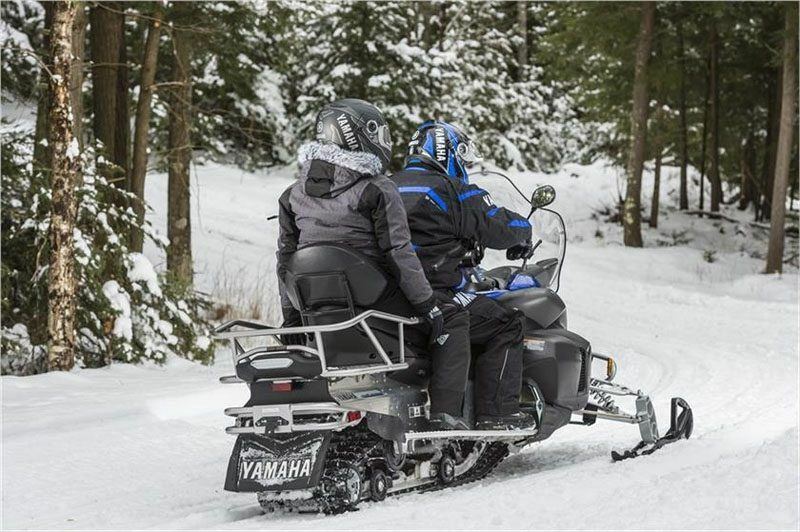 A unique articulated rear rail delivers additional passenger comfort in rough terrain while also making it easier to back-up in soft snow conditions. 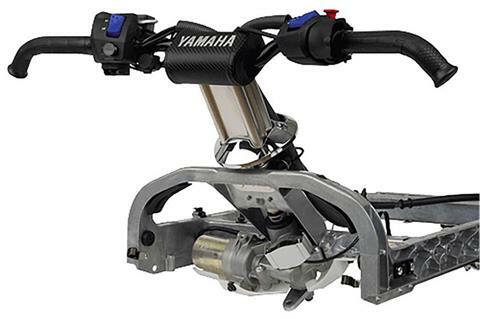 WIDE HOOKED END HANDLEBARS: Yamaha bars are flat and wide, engineered for comfort, control, and natural ergonomics. Integrated hooked ends add additional control options while cornering, and feature heated grips across that span the entire length. STANDARD ELECTRIC START AND REVERSE: Seamless and easy to use electric start delivers instant and hassle free starts, no matter the weather, eliminating the need for an “old-school” pull rope. You’ll also enjoy the convenience of an effective and simple to use reverse system, includes a helpful alert beeper so you always know when reverse is engaged. HPG COIL-OVER FRONT SHOCKS: High Pressure Gas (HPG) shocks with strong 40mm bodies are calibrated to deliver consistent performance and comfort with excellent fade resistance. Plus the shocks are rebuildable, ensuring you season after season of consistent performance with proper maintenance. RIPSAW™ II TRACK: Regarded as the best high-performance terrain track available, the 151 x 1.25" lug design of the RipSaw™ II delivers incredible acceleration, braking control, and handling in a wide variety of conditions. THIRD GENERATION FRONT SUSPENSION: The sophisticated and precise design of the front suspension incorporates a motion geometry specifically calibrated to eliminate unwanted inside ski lift while cornering. The dual A-arm system is both precise and remarkably predictable for confidence inspiring performance in nearly any terrain. HPG REAR SHOCKS: Premium High Pressure Gas shocks are found at both the front and rear arms of the rear suspension - tuned for premium control and comfort with incredible fade resistance. 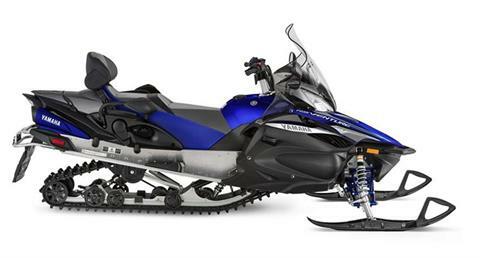 The shocks are also serviceable, allowing your authorized Yamaha dealer to recharge and refresh them for consistent performance season after season. GENESIS 1049CC 4-STROKE ENGINE: Designed to be the premiere trail cruising power plant, the three-cylinder engine features an advanced Yamaha fuel-injection system for incredibly accurate fuel metering for spot on performance and fuel sipping economy. A broad, flat power-band delivers instant thrust from nearly any speed, and hundreds of thousands of miles by satisfied owners is testament to its durability. 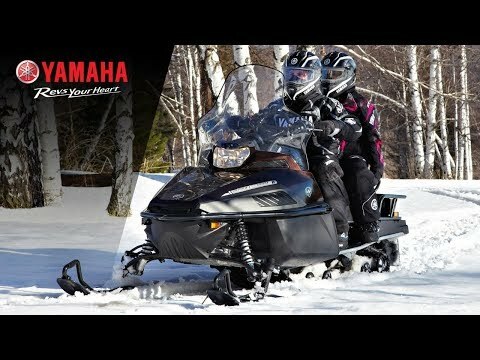 ENGINE BRAKING REDUCTION SYSTEM: Yamaha utilizes an engine braking reduction system for a “free-wheel” feeling on deceleration. The system allows a small amount of air to flow through the intake system upon throttle release, thereby dramatically reducing the engine braking effect typically association with a four-stroke engine. YAMAHA CHIP CONTROLLED THROTTLE (YCCT): Our electronically controlled throttle system delivers next level-performance, control and efficiency. The fully electronic system senses throttle input and electronically controls the throttle valve resulting in smooth, predictable performance specifically tuned for each model. The system serves up three user-selectable performance modes; S (Sport) Mode for maximum performance; T (Touring) Mode for smooth low and mid-range response and improved fuel efficiency; and E (Entry) Mode for predictable acceleration, reduced top speed and optimum fuel economy. 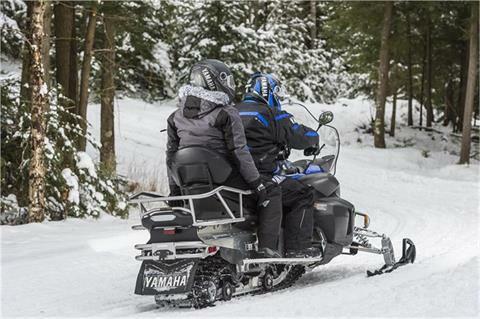 ELECTRIC POWER STEERING: Yamaha was the first and still the only manufacturer to offer Electric Power Steering to the snowmobile industry. The velocity sensing system delivers maximum assistance at slow speeds to nearly zero assistance and high speeds. Aside from dramatically reducing steering effort, the system reduces negative feedback, helping isolate the driver from unwanted steering effort. TUNER II SKIS: Developed exclusively by Yamaha engineers, the Tuner II ski incorporates a dual keel design that can be calibrated through various runners and carbide lengths for rider preference. The Tuner II ski dramatically reduces darting and steering effort while retaining predictable and sharp handling characteristics. ADJUSTABLE PASSENGER SEAT: The backrest is fully adjustable - a simple lever release allows the entire backrest to move forward or back for solo for two-up riding. An additional rotational adjustment for the rear cushion further enhances comfort and is bolstered by adjustable height, heated passenger grips. INTEGRATED HARDTOP STORAGE TRUNK: An oversized, 7-gallon rear storage trunk features a hardcover lid that is seamlessly integrated into the overall finish of the snowmobile. A weather-resistant gasket keeps snow and moisture at bay.